How can I find out whether my install of Windows (specifically XP and Vista) is either 32 or 64 bit? Additionally, how can I find out if my hardware will support a 64-bit operating system? 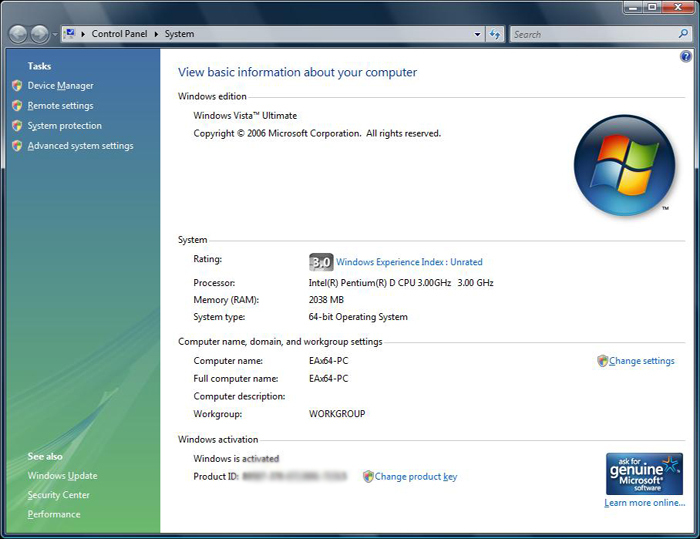 If you have Windows Vista, there are two methods to determine whether you are running a 32-bit or a 64-bit version. If one does not work, try the other. Click Start Collapse this imageExpand this image Start button , type system in the Start Search box, and then click system in the Programs list. Click Start Collapse this imageExpand this image Start button , type system in the Start Search box, and then click System Information in the Programs list. If you have Windows XP, there are two methods to determine whether you are running a 32-bit or a 64-bit version. 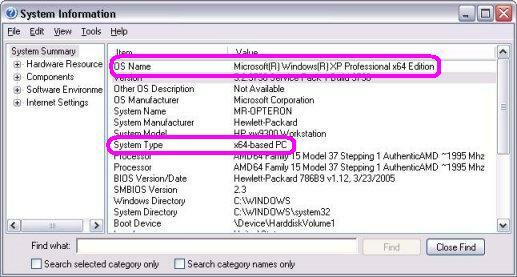 For a 32-bit version operating system: Windows XP Professional Version appears under System. Note is a placeholder for a year. As for hardware question, what hardware are you running? Intel: I actually don't know how to determine it is 64-bit other than looking for EM64T designation for the part. Maybe somebody else can have a better answer here. If you are running the part, just run CPU-Z on it. It just has to support a processor that is 64-bit. Open a command prompt and type set proc. If the output includes PROCESSOR_ARCHITECTURE=AMD64, you're using 64-bit Windows. If the output includes PROCESSOR_ARCHITECTURE=x86, you're using 32-bit Windows. However, if the output also includes PROCESSOR_ARCHITEW6432=AMD64, this means that you're running a 32-bit command interpreter on 64-bit Windows. If you mean physically have 64 bit, most modern computers do - check either Intel or AMD for your CPU. For Windows XP, Vista and 7, the easiest and by far the fastest way is simply to open your C (or alternate root) drive and see if you have both a "Program Files" directory and a "Program Files (x86)" Directory. If you do, you are running 64 bit, if you only see "Program Files" you are running 32 bit. For XP, I think you just see x64 if 64 bit, and nothing for 32 bit systems. If you're stuck in a computer lab that has everything locked down for "security" reasons (like those at my university), you can still run CMD and type in SystemInfo. Once that's completed running, scroll to the top of the list and locate "System Type:". I can't remember what it says on a 64 bit OS, but a 32 bit says "x86-based PC". That being said, a 64 bit OS will probably say "x64-based PC". To your question how can I find out whether my install of Windows is either 32 or 64 bit? It directly gives you your answer. Not the answer you're looking for? Browse other questions tagged windows windows-vista 64-bit 32-bit or ask your own question. Simplest way to instruct an end user to discover if Windows is 32 or 64 bit? How do I check whether my hardware is 64-bit capable in Windows? Does my processor dictate 32-bit vs 64-bit Windows operating system? 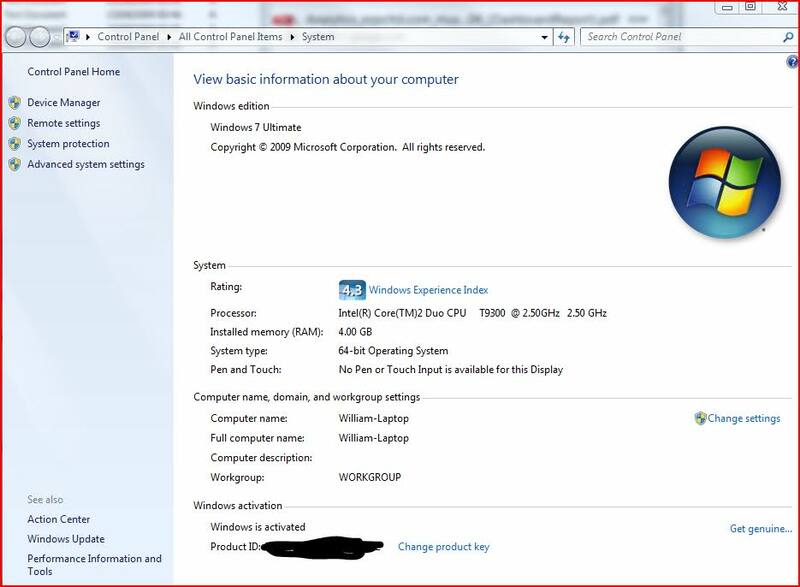 How can I find out which version of Windows 7 I am running? 64-bit or 32-bit? Downgrade Windows 7 from 64-bit to 32-bit?